Domme is the lair of a Fryse Hag south of the Mortrag Glacier. 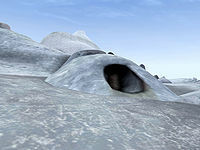 Located just south of the coastal inlet, the medium ice cave is a major base for Fryse Hags. In a hall across from the entrance, you'll find three Fryse Hags guarding a treasure chest with random minor loot. 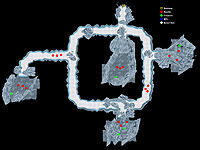 A tunnel leading west reveals two more groups of three, and to the south, two hags guard two chests with gold and better loot. At the eastern end is yet another group, guarding barrels with ingredients. This page was last modified on 13 April 2013, at 21:46.